Madge realises that she's been robbed. Madge is dismayed to find that all her cheque books and credit cards are all gone. Also the money has gone from the tin. Suddenly she realises - it must have been Henry's mate Rex because he knew there was money in the tin. She tells Charlene to ring the police. 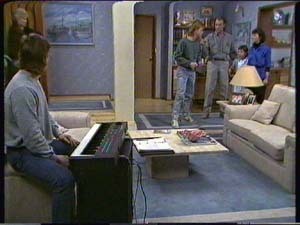 Mike and Scott are still playing but Lucy pulls the power out of the keyboard. Jim sends Scott off to do his homework. Madge comes in to tell them about the burgulary. Jim and Ruth tell them that they did see someone and they describe him to Madge. Madge nods in recognition and goes off home to wait for the police. Helen tells Jim that they really do need a Neighbourhood Watch scheme - they'll get training in how to spot a thief. Madge is convinced the burgular was Rex based on Jim and Ruth's description. Charlene thinks Madge is being hasty - and if she says anything, it could get Henry into trouble too. Henry's up for parole soon and it could jeopardise his chances. 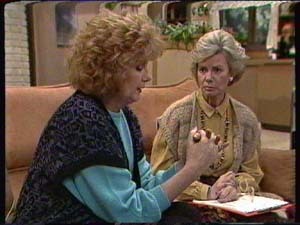 Charlene accuses Madge of not caring about Henry. The police are just leaving. 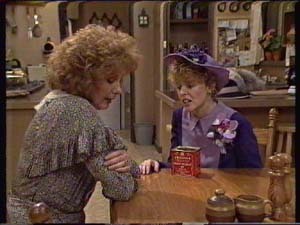 Madge tells Charlene that she kept Henry's name out of it. But Madge says she's going to the prison tomorrow to talk to Henry. Helen comes to see Madge. 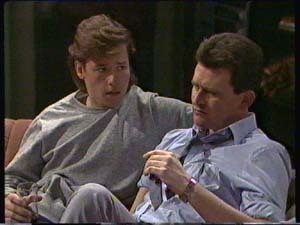 Madge sits down with her and tells her that Henry might have put Rex up to the robbery - he has a very big chip on his shoulder. 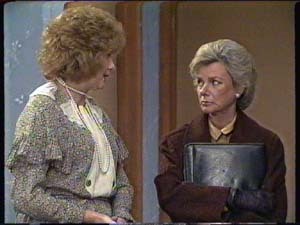 Helen tells Madge about the Neighbourhood Watch scheme - she needs twenty signatures. Madge signs immediately. Daphne is cooking up a storm but Des and Mike are more interested in watching sport on television! Des says he's a mate of one of the famous footballers, Warrick Capper, but noone believes him! 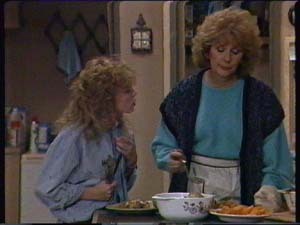 Jane is studying at the Ramsays while Madge and Charlene serve up the dinner. Charlene whispers to Madge that she doesn't think Henry would rip his own mother off. Charlene and Jane eat dinner in front of the television. A programme about cheerleaders is on. Charlene quite fancies being a cheerleader. Madge turns the TV off and tells her that studying is more important. Scott is messing about on his guitar while Ruth helps Lucy with her homework. The phone rings and Helen answers it - it's an international call for Ruth. Scott goes over to Mike's for half an hour. Ruth comes off the phone and tells them that her husband's business partner Adrian is taking longer to get the money to her. Jim, Helen and Lucy tell Ruth to stay on with them. Helen says Ruth is practically part of the family, but she does not look entirely pleased. Scott and Mike have finished their song and want to use Des and Daphne as guinea pig listeners. Des and Daphne aren't too keen at first, but as they play the song they quite enjoy it! At the end they tell Scott and Mike genuinely that their song is really good. 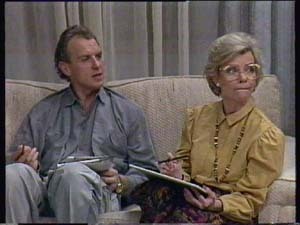 Des suggests that they find a producer - Daphne says she's read an article about a bloke called Brian Hanson who takes new talent - they could try him. DES: Just remember when you make your first million, you put it into my bank! Scott and Mike are going over the finer points of their song while Jane is trying to study. Charlene comes to join them and tells them about the robbery. Apparently the police have caught the guy, but Charlene's more worried about Madge blowing Henry's chances of getting parole. 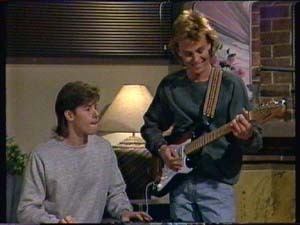 Scott and Mike start talking about their song again, so Jane and Charlene go off to try somewhere quiet to study. Helen and Madge have arrived back - Helen gave Madge a lift to the prison. Madge has seen Henry and apparently he was quite pleased to see her - Madge thinks Henry may be mellowing a bit. He didn't know anything about the robbery - he only told Rex about Charlene so she could help him get back on his feet. Des is on the phone to the famous footballer, arranging to meet him at the Coffee Shop at lunch time, so he can prove to Daphne and Mike that he knows him! 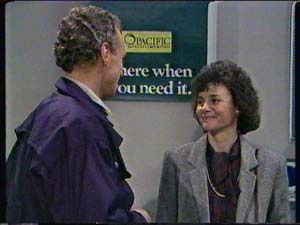 Ruth is shown in to Des's office. He says as soon as her forms are processed she can have her money. Des asks if she'll be looking for her own place, but Ruth says Jim has asked her to stay on. Ruth asks Des to keep her affairs confidential. As Ruth exits the office, Jim happens to be there. She tells him that the money won't arrive for some time! Jim says he's pleased - it means Ruth can stay on. The famous bloke, Warrick Capper, comes in, much to Daphne's surprise. Charlene and Jane come in and are excited to see him too. Finally Des comes in and Daphne is surprised that Des really does know Warrick! Charlene asks him to arrange an audition for her and Jane to join a famous cheerleading squad!